Did you know that many common aquarium fish do not have to be kept in heated tanks under totally controlled environments? What if you could liven up that backyard pond or fountain with colorful tropical fish this summer? In certain environments, you can keep many aquarium fish outside year-round. Having colorful and active fish in fountains and ponds both outdoors and on porches can solve several problems you may otherwise have with outdoor bodies of water. Any insect larvae that happen to be born into the water are prime food for the fish. You rarely have to feed these fish since they are in nature and fend for themselves quite well with algae and other naturally growing outdoor goodies. You also will not have a cloudy water problem once you reach homeostasis. Your fountain or pond will take on a level of interest for guests to marvel at, rather than just be a body of empty water. The average temperature must be consistently over 60 F at night and over 70 F in the daytime. The pond needs to be at least partially submerged in the earth, which “normalizes” the average temperature within the body of water. A fountain with a substantial thickness in the pond area also could work. The pond needs sufficient plants so the fish can seek shade from the intense summer sun, and the water level has to be kept up with either rainwater or aged water, not directly from a garden hose, though overspray from a sprinkler system will not hurt them in small amounts. Grass clippings should not be allowed to fall into the pond since this risks cross-contamination by pest control substances or fertilizers that could poison the fish and plants in the pond. Cut grass will also decompose quickly and contaminate the water, making it cloudy. Until the fish are established in nature, feed them once a day with general fish food, similar to what you would feed them in an aquarium. As long as tropical fish are put outside in ponds and fountains of sufficient depth after all fears of frost are over and brought back inside early in autumn before temperatures drop below 60 F, many species can thrive in the summer ponds of temperate and subtropical climates. Some of the oldest varieties of aquarium fish are called tropical fish, but come from more temperate climates, and survive very nicely in unheated aquariums. The Paradise Fish (Macropodus opercularis) and the Whitecloud Mountain Minnow (Tanichthys albonubes) are good examples of heartier species of tropical fish that do not need much warmth. 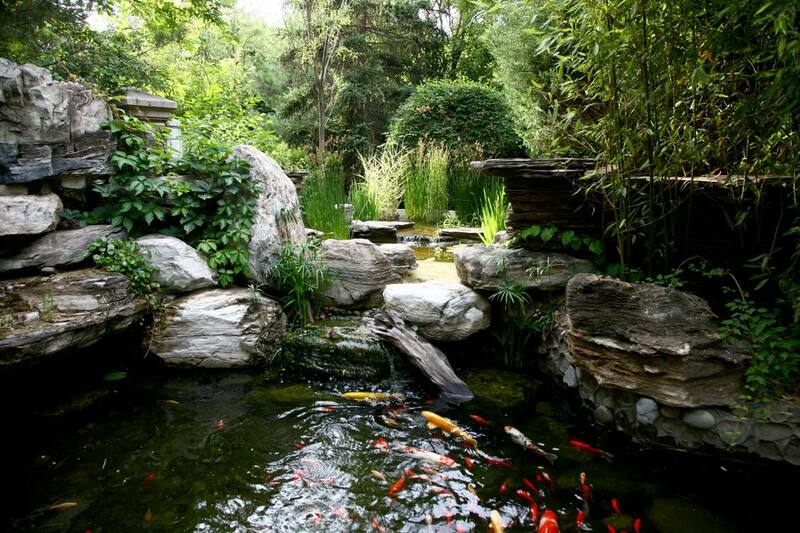 Goldfish and Koi have long been good pond fish since they can even handle the icing over of water. They must be protected from predators like cats and birds, however, since the goldfish species become quite large. Goldfish and Koi are not effective in controlling mosquitoes like guppies and tend to be dirty fish requiring much more maintenance and filtration than smaller aquarium fish. Guppy, Molly, Swordtail, White Cloud Mountain Minnow, Blue Gourami, Paradise Fish, Cory Catfish, and Plecostomus Catfish all are ideal for your outside project. Naturally, all fish must be properly acclimated to outside pond water. If the pond is long established in homeostasis, it is a good idea to make a bucket of 1/2 pond water and 1/2 aquarium water and let the fish get used to the “natural” outdoor water for a few hours. Whether or not you do this acclimation, you must put any fish in a plastic bag of the water they are coming from and float it in the pond to equalize the temperature for at least 15 to 20 minutes before releasing the fish into the pond or fountain. Although most of the fish described above are hardy, you must look out for predators. Larger fish like goldfish and Koi may be attacked by cats, racoons, or even passing birds of prey. The smaller aquarium fish like guppies, platys, swordtails, and mollies are so prolific, however, that their constant addition of new fry will outpace just about any predator—another great reason to try these mosquito-eating marvels. Keeping outside summer ponds free of mosquito larva also means no harmful chemicals are needed like chlorine and other pond and fountain maintenance chemicals.